As a leftist, I’m used to despair. How many hours have I, like so many others with an ounce of humanity in them, sat alone in my room miserably reading about global warming, horror-struck at the scorching hellscape we’re leaving our descendants? How many times have I sat frozen in rage and disgust as I thought of the impunity of the “masters of war” sheltered behind piles of money, protected from the just comeuppance due them for their genocidal war-games—for it’s all a bureaucratic game for them, a very serious game involving clever political maneuvers geared to the sole objective of conquering even greater power and wealth. On the one hand are the Henry Kissingers (who of course live forever) and Barack Obamas making the cocktail-party rounds, being fêted by a fetid power-worshiping culture of amoral sycophants and groupthinking herd-people, the social climbers never disturbed by a twinge of conscience despite the most unspeakable of crimes. On the other hand are their victims: the thousands of young people, mercenary instruments of the powerful, drawing their last agonized breath in muddy blood-puddles on the battlefield; the children clinging to their mother’s mutilated corpse, looking around the street for her arms blown off her body when the bomb exploded; the father who comes home to find that his house and his family no longer exist. How can one not grieve—forever—from all this, and from the absurdity and meaninglessness of such a tragic, farcical world? It’s so easy to see no hope whatsoever. Or to recoil misanthropically into one’s cocoon away from the stupidity and evil of late capitalism. It would seem that almost everywhere, the signs portend doom. There is no need to interpret them all, yet again. Others have done so with great eloquence, and one has but to read the daily news or contemplate mass obsessions with pop celebrities and the latest video games to come in danger of losing all vestiges of faith in humanity. But then, after I turn away from the overwhelming bleakness, a contrary impulse enters my mind and I remember my Goethe and Nietzsche: life-affirmation, despite everything, is a more profound truth than pessimism and despair. The latter are exactly what the bureaucrats-in-chief, the rulers of the world, want you to feel, so that you’ll do nothing and let them go on getting richer. Few states of mind are less revolutionary than the collapse of the will, than apathy or absolute hopelessness. It’s more challenging, more productive, and, in a sense, more beautiful—even more moral—to affirm and not only to negate. So I find it important to take breaks from the dreary reading and remind myself of simple joys and hope. It’s essential to periodically rejuvenate the will, an imperative I personally can fulfill only by purging my mind of everything remotely bureaucratic, institutional, and authoritarian. For instance, it’s very difficult for me to listen to, say, a festive Irish fiddle while thinking of peasants dancing outside in the spring air, shouting, cheering, and clapping, without at the same time feeling deep gratitude for being alive. Just imagining the scene, this bucolic antithesis of bureaucracy and authority, is enough to melt away the contempt and despair. Or I might listen to Beethoven, the greatest of all life-affirmers, whether in one of his exuberant moods or in a ravishingly lyrical one. Or Schubert, or Mozart. Good classical music is perhaps the most left-wing of all music, in its ennobling sublimity, its emotional accessibility, its democratic appeal to everyone from the age of 1 to 101, its rationalistic spirit, its humanism, its being the very opposite of everything commodified, artificial, machine-like, and money-produced. Nothing is less stained than Mozart. This is the spirit that ought to, and tends to, animate the left, this freedom-loving anarchistic spirit of sheer creative individuality. Which of course goes along with the creative and democratic collective, since in a truly human society “the free development of each is the condition for the free development of all.” We should leave everything that vitiates hope and vitality to the right-wing, since the right-wing is defined, in effect, by its commitment to the anti-human: hierarchy, capital accumulation, profits over people, privatization and atomization, ecological destruction, hatred of the Other, bigoted nationalism, imperialistic savagery, etc. Apathy and hopelessness are appropriate right-wing emotions; bureaucracy and institutional thinking are right-wing phenomena (notwithstanding the usual reactionary attacks on “government bureaucracy”). Joy and empathy are inherently left-wing, because deeply human, connecting, and empowering. In the task of purging oneself of right-wing traits and maintaining a positive outlook, it’s essential also to cultivate open-mindedness. One would expect those on the right to be closed-minded, not only because of the closed-off nature of the “authoritarian personality” but also because the essence of reactionary ideologies is commitment (explicit or implicit) to hierarchy and authority. The left-wing valorization of reason, dialogue, democracy, and empathy, however, should entail willingness to consider opposed perspectives on their merits rather than reflexively attacking them. It’s unfortunate and ironic, then, that there’s so much closed-mindedness on the left, so much sectarianism. Whether among Marxists, anarchists, Leninists, feminists, left-liberals, or any of the countless other schools and sub-schools of thought, the hostility to potentially challenging ideas is deplorably common. That Marx and Engels themselves were highly sectarian is no argument in favor of it. One has but to reflect on how much damage sectarianism inflicted on the New Left in the 1960s, not to mention the Old Left in the first half of the twentieth century, to realize that it’s a pretty stupid way to behave. With greater openness to, and willingness to ally with, other non-reactionary perspectives comes greater political efficacy, a broader sense of solidarity and consequently “empowerment,” a less narrow, crabbed, bitter, misanthropic individual character, and a more expansive and generous view of humanity and life itself. This is quite apart from the principled nature of such a stance, the fact that it is itself a realization of leftist morality. Another way to overcome jaundice and despair is to appreciate the degree to which left-wing ideals are already manifest in ordinary life. For human nature has a solid anarchistic and communistic component. (See Kropotkin’s classic Mutual Aid: A Factor of Evolution.) As David Graeber has argued, if communism means “from each according to his ability, to each according to his need,” then it is the foundation of human sociability—“the raw material of sociality, a recognition of our ultimate interdependence that is the ultimate substance of social peace.” The only reason society is able to function at all is that it’s held together by a dense anti-capitalist fabric of sharing, helping, and cooperating, i.e., giving to others in need what you’re able to give them, even simply advice, sympathy, assistance at some task, or a bit of money. In effect, to be a leftist means to want to elevate this “baseline communism” to a more determining principle of social organization, not only for its own sake but also because that would further the goals of popular freedom and power. Rousseau may have been wrong that human beings are naturally “good” (though neither are they naturally bad; they’re both), but at least we can appreciate and be grateful for the spontaneous communism and sympathetic happiness that continually well up from humans’ psychic depths. All these considerations and pleasures help me avoid a relentlessly dreary attitude, but in the age of Trump a new factor has come into play: genuine hope that a popular backlash against neoliberalism is developing. Finally! After forty years, it’s about time. And since neoliberalism is just capitalism on steroids, capitalism itself is becoming a target for increasing numbers of people—to the horror of “moderate Democrats.” The once-vital center is disintegrating, as a semi-fascist right and a semi-socialist left rise from its ashes. Such a historical moment certainly presents dangers, but it also presents opportunities not available during quiescent or “centrist” periods. In fact, history teaches us that progress can happen most rapidly in moments of crisis, when people are open to radicalization. The Great Depression in the U.S. is an obvious example, for it bred popular movements that birthed both the welfare state and mass industrial unionism. The inevitable next economic crash will have a similarly galvanizing effect on social movements, strengthening and radicalizing the “Resistance” that is currently in its infancy. We are, indeed, embarking on an era second to none in historic importance. As I’ve argued in Worker Cooperatives and Revolution: History and Possibilities in the United States, it is only in the twenty-first century that a post-capitalist “revolution”—in whatever protracted, global form it will take—has finally been placed on the historical agenda. Marx, not foreseeing state capitalism and the welfare state, got the timeline wrong. But the basic idea of a final colossal confrontation between capital and the majority of humanity was accurate. Only, this ‘final’ confrontation will last generations. And it is beginning now, not a hundred years ago. With the stakes so large, this epoch really amounts to the climax of human history. We can’t know how the struggles will play out; we can only wage them, and analyze the historical tendencies that bear fruit in them. In the meantime, we have to ward off hopelessness—by remembering that bleak times are nothing new, that progress has been made even in darker times than the present, that life is full of joys and pleasures we too easily take for granted, that it’s necessary to unite with all comrades on the left even when we disagree on particulars, and that even non-leftists or not-yet-leftists can be appealed to on the basis of their communal urges and sympathies. It’s a tremendous responsibility we bear—we’re responsible for the fate of the species, and of life itself—but it’s a tremendously exciting era we’re entering. Life-affirmation, despite everything, is a more profound truth than pessimism and despair. 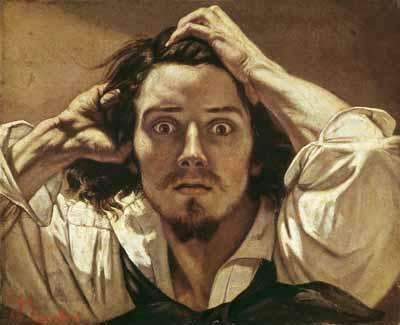 Didn't realize Courbet also did the Proudhon painting. Chris Hedges and worker coops don't really inspire me though.